Repairing newer Mac hardware, such as the 2018 Mac mini and MacBook Air, at an unauthorized service center may soon be impossible thanks to new diagnostics requirements involving Apple's T2 security chip, the company recently confirmed. Apple confirmed to The Verge that, under a recently revised repair process, only certain authorized replacement parts will work in a T2-equipped machine. Specifically, when critical hardware like a Touch ID module or logic board is replaced, the T2 chip renders Mac inoperable until the repair facility runs a piece of special diagnostics software. Apple could not confirm which products or repairs the new policy affects, nor could it say when the procedure was first implemented. Word of the revised policy surfaced in October, a month after Apple circulated a document to Authorized Service Providers detailing a modified repair procedure that requires proprietary "system configuration" software to be run after certain hardware components are replaced. The software, called Apple Service Toolkit 2, works in conjunction with the T2 security chip and includes a "Mac Resource Inspector" and tools that examine a variety of computer systems including memory, display, power adapters and cooling system. Importantly, the toolkit is restricted to authorized personnel who have access to Apple's Global Service Exchange (GSX) network. Apple's new process makes it exceedingly difficult, or in some cases impossible, for consumers to have their machines repaired by third party. This poses a problem for people who do not live near an Apple Store and rely on third-party repair shops to get their equipment fixed in a timely manner. The protocol has renewed suspicions of "planned obsolescence" and, more directly, a potential play at "right to repair" legislation being readied in a number of U.S. states. Advocates of the latter are already speculating as to why Apple instituted the T2-based protocol. "It's very possible the goal is to exert more control over who can perform repairs by limiting access to parts," iFixit CEO Kyle Wiens said in a statement to The Verge. "This could be an attempt to grab more market share from the independent repair providers. Or it could be a threat to keep their authorized network in line. We just don't know." 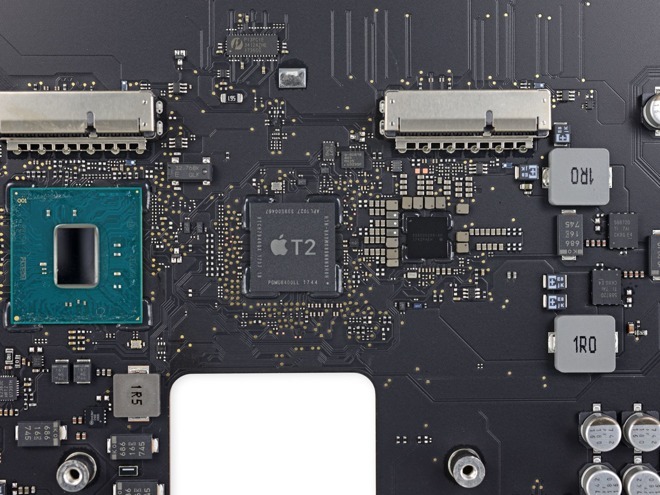 Early last month, the repair specialist tested the T2 repair procedure by swapping out the display and logic board of one 13-inch MacBook Pro with another, finding neither part replacement rendered the machine unusable. Display replacement does not require use of AST 2, Apple confirmed to The Verge, though it is unclear why iFixit was able to swap out logic boards. The T2 coprocessor serves a variety of functions including the always-on "Hey, Siri" functionality on the new MacBook Air, preventing ne'er-do-wells from accessing the microphone when the computer is off, securing the Touch ID sensor, and stores cryptographic keys used in the secure boot process. Apple has included T2 in several Macs to date — the new Mac mini, MacBook Air and iMac Pro — and is expected to continue rolling out the chip as new models are released.